My aunt visited me around easter, so ofcause, I had to make a cake. A great excuse for making cake. And it only gets better when you make someone else happy. 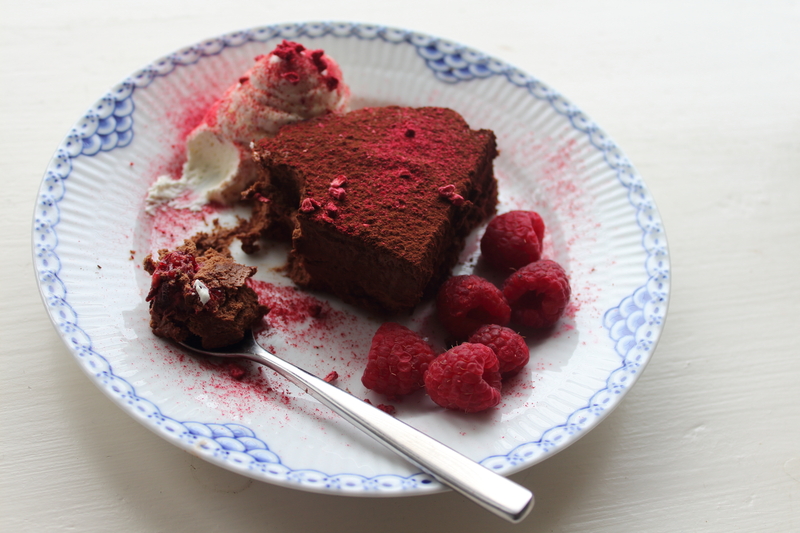 She really liked this cake/mousse and so did I. It´s a Mette Blomsterberg recipe. She is a danish pastry chef and she is really good. It´s not the first time I use one of her recipes and it wont be my last time. Sure, this is NOT the most healthy thing to eat, but as long as you don´t eat an entire cake by yourself and BTW remember to eat healthy most of the time, then I think it´s okay. You have to treat yourself with something good every now and then. 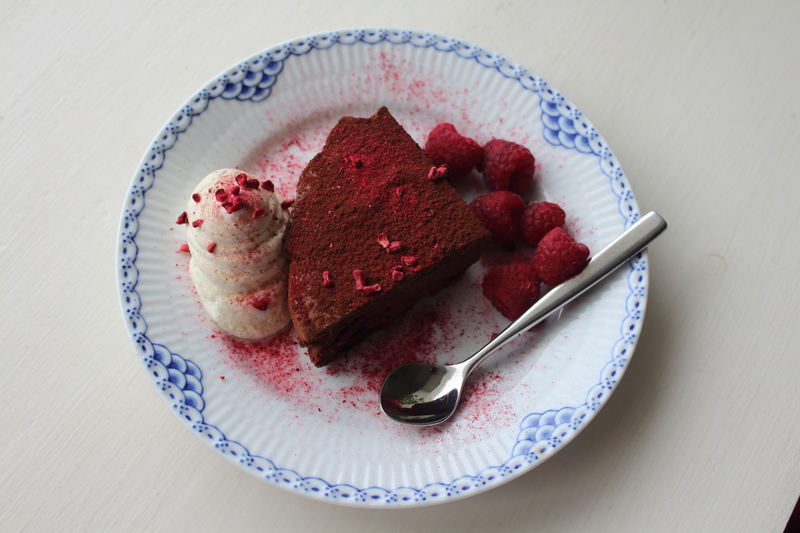 Mette Blomsterberg calls this cake for: Serious chocolate, and so it is. And you need a springform. I used one there was 15 cm in diameter, which was perfect. This is a mousse and therefor, you can easily make it the day before, actually that would be the best(I did that) or you can make it two days before. It needs at least 4 hours in the fridge, if you don´t have the time, to make it the day before. Start by splitting the vanilla pod lengthwise and scrape the vanilla grains out. Then you whip the egg yolks, the vanilla grains and the icing sugar with a hand mixer to a thick egg nog. Chop the chocolate thoroughly and melt it in a water bath. Make sure, that there don´t come any water in the chocolate, because then it´s ruined. Make sure that the chocolate is good snug. Whip the egg whites stiff with the icing sugar. Make sure that there isn´t small lumps in. Whip the melted snug chocolate in the egg nog. Add half of the stiffly whipped egg whites, while whipping. Then mix the last whipped egg whites in, and toss it all carefully together. Put a piece of baking paper in your spring form. The paper must cover the bottom and sides without folding too much. Add the raspberries in the chocolate mass and turn it carefully 3 times and then put the mass in the form. 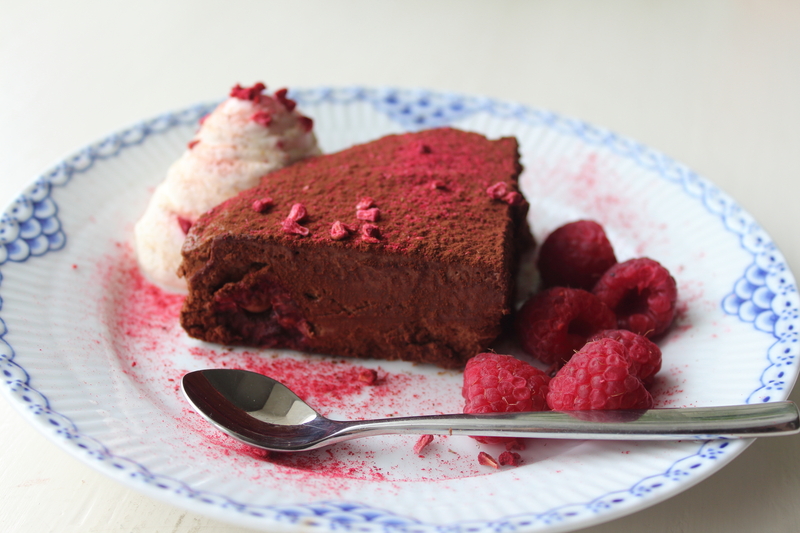 If you are adding extra raspberries, then start with adding 75 g in the cake, and then dump the last 75 g on the cake after you put it in the form, but do push the raspberries into the chocolate with your fingers or a spoon, as much as you can, without getting chocolate on your fingers or spoon. This will make the surface of the cake look prettier. Put it in the fridge, for at least 4 hours, but it´s preferable, that´s it´s for longer. 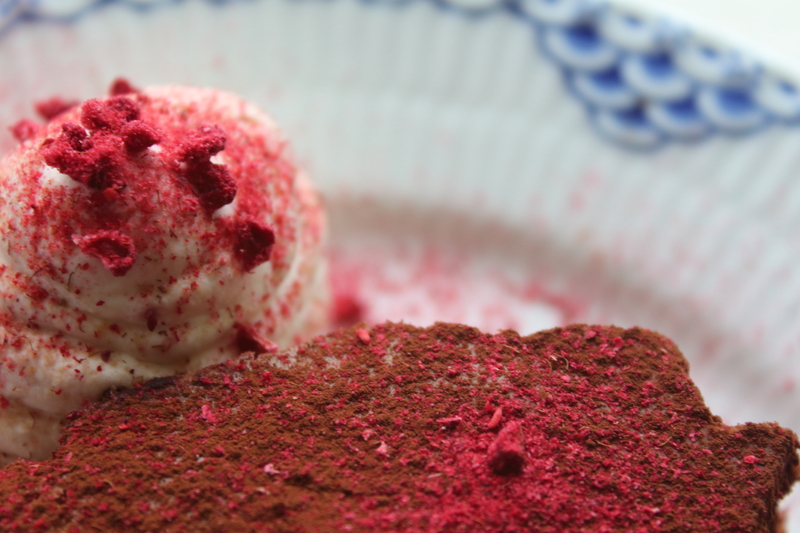 Before serving the chocolate mousse, you cut the mousse cake with a warm and sharp knife. Boil enough water, so that if you put it in a tall cup, the blade of the knife will be covered in water. Now did the knife in the hot water every time you cut a piece of cake. If not, then it the mousse WILL stick to the knife, and it will end up looking messy. 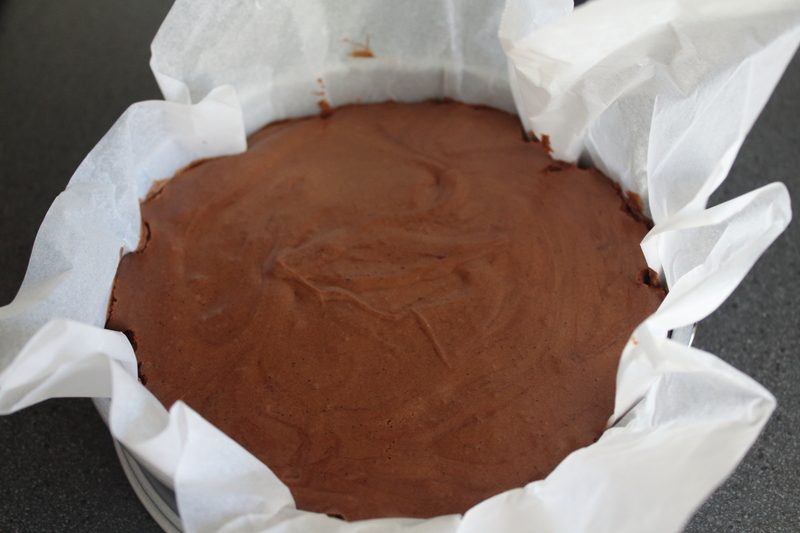 Remove the baking paper after you have cut it, it´s very easy to do so. 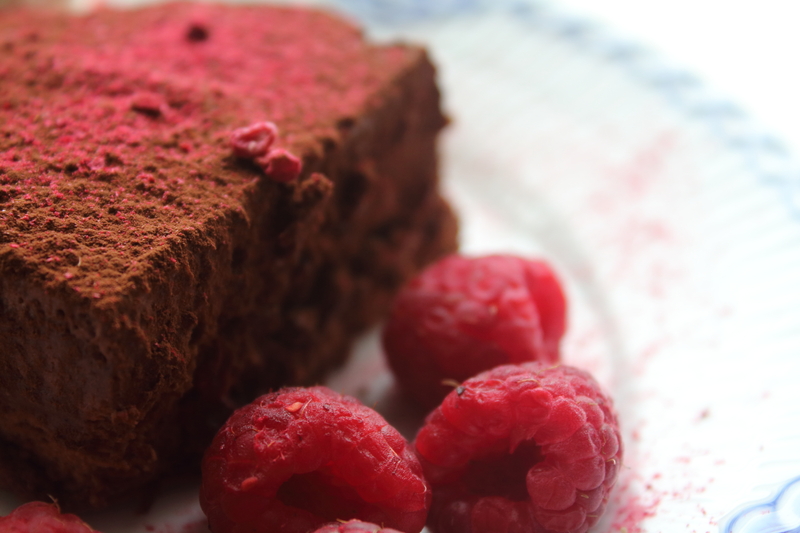 Serve it with fresh raspberries, and cacao sprinkled on top of it. i mostly added whipped cream for the looks. This entry was posted in Cake, Food, Sweets and tagged cake, chocolate, dessert, mousse, raspberries, royalcopenhagen, yummy. Bookmark the permalink.